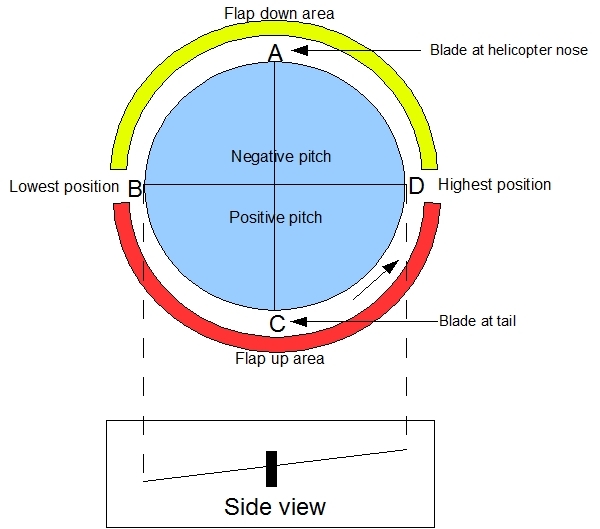 When flying a helicopter, the pilot is continuously controlling 2 important parameters: the amount of thrust, which is achieved by changing the pitch of all of the blades simultaneously, also known as collective pitch control; and secondly, the direction in which the rotordisc is tilted. This is achieved by applying cyclic pitch, which influences the blade's angular position within its circle of rotation. We will look at how these pitch changing mechanisms work with a rotorhead in this section. Both collective and cyclic control are achieved with the swashplate system, which is comprised of 2 rotating discs, and transfers the control inputs into the blade angles. 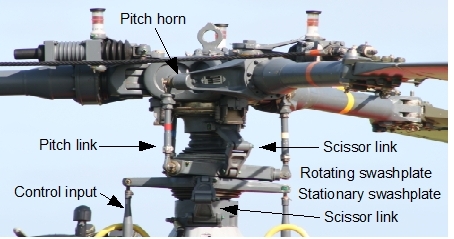 The control inputs are connected to the lower disc, while the upper disc is connected through the pitch links and horns to the rotating blades. The lower disc is also called the stationary disc, because it does not rotate. The upper disc, on the other hand, rotates along with the blades. The 2 discs are connected via a bearing. In this way, control input is transferred into a change in blade pitch (angle). The lower swashplate can also tilt in any direction by means of a spherical bearing. A pair of jointed scissor links is included in the system. One of them is used to prevent the stationary disc from rotating with the upper one, while the other connects the upper disc to the rotating shaft. In this way, it (the upper disc) will rotate at the same angular speed as the blades. Scissor links are used because the swashplate assembly must be able to slide along the shaft. The collective control works by sliding the swashplate up and down. This movement will change the pitch of all of the blades simultaneously and by the same amount. Cyclic control tilts the swashplate, thereby changing the pitch of each blade continuously through each blade revolution. The control inputs are connected via a mechanical mixer to the swashplate. This mixer allows the swashplate to rise and fall (collective control) whilst tilting with the cyclic input. 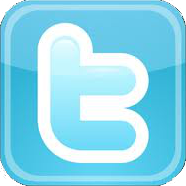 Some hard thinking is required to fully understand how cyclic control functions. It can be very instructive to look at a real swashplate when someone is moving the collective and the cyclic controls, and there are some very good animations of this on YouTube. For example, take a look at the S-61 Sea King Rotor Head Animation, in which the working of the scissor links (they are red) becomes pretty clear. The video also shows how moving the swashplate up and down changes collective pitch. The real strength of this animation comes from its demonstration of how cyclic pitch works, using different camera positions to illustrate the effect. This first camera looks at the swashplate system from a static position, whereas the second travels with a blade! Note that the viewpoint is now from a rotating frame of reference, meaning that the blade and control links and rods (yellow) appear to be static (non rotating). It can now easily be seen that, with each revolution, the blade pitch changes up and down. Note that with this camera position, the lower disc suddenly appears to rotate in the opposite direction, because it is the upper disc which is travelling. The third camera position also rotates with a blade, but it is now looking at the blade tip. This animation should show you how the swashplate functions and effects blade pitch. Cyclic pitch leads to a blade that is travelling up and down with each revolution. So, in a rotorsystem which rotates at 450 RPM, each blade is driven by a cyclic pitch with a frequency of 7.5 Hz, when it is applied. Most swashplate systems are designed to drive the cyclic blade angle with a sinusoidal function. When the swash plate tilts in a certain direction, cyclic pitch is introduced. The question now is: how does tilting the swashplate in a particular direction influence rotor disc attitude (and its thrust vector)? We will, therefore, now examine the circumstances in which the swashplate is tilted forwards, and will assume that there is a counter clockwise rotating system (viewed from above). To assist our line of reasoning, we will first focus on 4 strategic points on the circle of rotation, and will examine the blade angles at these points. The points (A to D) are each 90 degrees apart, and the figure below sets out their locations. To understand what the blade angle is at these points, there is something else we need to know: the configuration of the control rod and links. In this example, we will assume that these are attached to the blades’ advancing site. Note that the maximum amplitude is related to the angle at which the swashplate is tilted. The figure shows the quadrants in which the blade angle (pitch) is positive and negative, and we will now look at the behaviour of the blades in each of them. If the angle is positive, it will rise. If the angle is negative, it will fall. Following this line of reasoning, it is clear that the blades will be at their highest position at point D, because they have travelled for 180 degrees in an upwards direction. Similarly, the blades will be at their lowest position at B. The altitude of the disc is, thus, sidewards, meaning that this helicopter would move to the left if the swashplate is tilted forwards. This probably isn’t what you expected! Clearly, there is a 90 degree difference in the tilting direction between the swashplate and the rotordisc. This is known as the phase lag. Note that there is another way of explaining this phenomenon, namely in terms of gyroscopic precession. Both have the same result, and so we won’t consider this latter explanation any further. If it is not compensated for, the phase lag between the swashplate and rotordisc would make the life of the pilot very difficult. The way to overcome this problem is to connect the control inputs to the swashplate 90 degrees in advance of the blade to which they relate.